I posted a very candid post on Instagram last week about my body positive journey I’ve been on over the past 18 months or so. Learning to love myself for who I am right now hasn’t been easy, but it’s been so good! I normally share photos of my home and how I feel about certain projects or home decor decisions, but I felt a push to be a little more vulnerable and share about a journey I’ve been on since the beginning of 2017. My post got a bunch of comments from other women who feel the exact same way! Or they are struggling to love the body they have now. So, I wanted to share it here in case you needed a little body love encouragement, too! Note: if you’re looking for more cute outfits for fall, check out my fave finds from the Nordstrom Anniversary Sale!! So, here’s the thing. I hate a bandwagon. 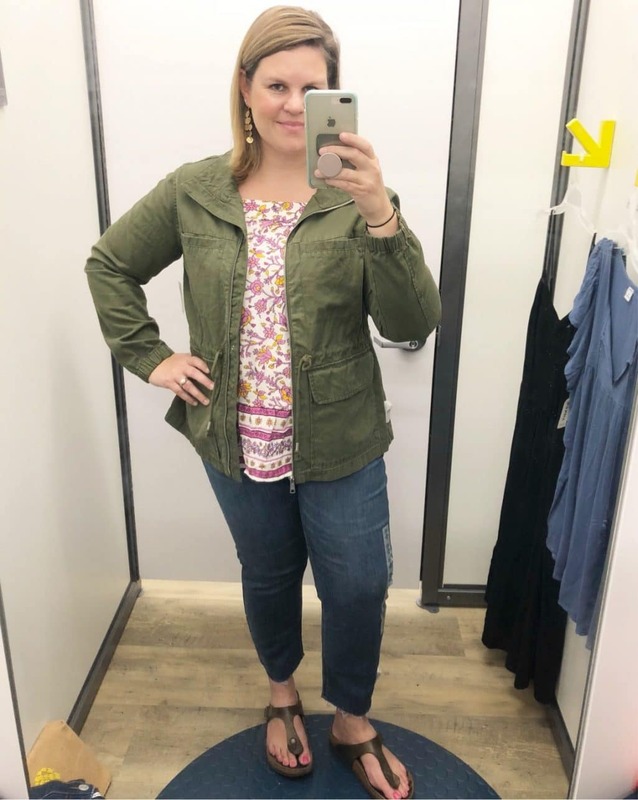 I kind of revolt when I see that “everybody else is doing it.” So, the fact that I’m showing you a picture of myself trying on clothes feels very strange. But I’m trying to overcome the weirdness for a good reason. Over the year of 2017 I made huge strides in accepting myself right where I am. In fact, I have my whole life wished I looked different, skinnier, smaller in this particular spot, less cellulite in that spot and less bulgy-ness over there. . But I decided that I would love myself right where I was and start taking care of this body of mine just for the sake that it freakin’ houses me every moment of every day. It walks me places, lifts heavy furniture that I’ve built with these two hands and grew 2 sweet babies in my very own womb. I mean, if you stop and think about it your body is such a gift. So, I started to treat it as such. Over the course of last year, as a part of this journey, I decided to buy clothes again. You see, I’d quit buying cute clothes because I didn’t like the way I looked. But when I looked around I saw women in my life who looked like me and looked fabulous. I wanted what they had. So I tried on clothes and bought clothes and took back clothes if I didn’t freaking LOVE them on me. There’s no use in taking up space in my house if I don’t love it, ya know? I branched out and decided to show up in my own skin for my own life. And I discovered along the way that you CAN feel beautiful in whatever skin you’re in. None of this, “I’ll punish myself by wearing ratty old clothes until I perform and lose this weight.” Nope. Not anymore. The weight is its own thing, not a reflection of whether I’m worthy of new, pretty clothes or not. All of that loooooong sermon to say, I’ve found some new staples that I love and I wanted to share them with you. A lot of the women I follow in the fashion world are a size XS and 0. Not me. I’m a size 16/XL. So, if you’re wondering if what that skinny model has on will look good in your XL frame, here ya go. I won’t be turning this Instagram account over into a clothing and style space. But what I will do is share what I love. And maybe it will help you find some pieces that you love, too! Today that is this outfit, which I stinkin’ LOVE. I tried on a bunch of clothes yesterday, but I kept coming back to this one. Moving More & Loving It! I wanted to elaborate that this change gave me the boost I needed to really start working out again. Isn’t it funny how when I let go of my high expectations, I could finally tackle the things I’d been wanting to tackle. In the past I always would work out to fit into a smaller size or lose a certain amount of weight. But when I hit my goal I would stop working so hard or stop altogether. So, now I work out because of how it makes me feel! I feel strong, mentally well and physically better when I work out. I feel like I’m a better mom and wife (hello endorphins) and just FEEL so much better. When I make life choices regarding how it makes me feel and I zero in on my emotions and well-being, my new routine become a habit. I’ve consistently worked out 2-3 times every week for almost a year! Woohoo! Have I lost any weight because of working out? Not a pound. So do you see the switch there? I’m not saying that goals are bad. I’m a firm believer in goals. But I was living my life with this pressure of performance and how I needed to weight a certain weight or fit in a certain size in order to enjoy my life and embrace my body. But I’ve only got one life! I don’t want to look back on my 30’s and wish I’d really lived instead of striving and trying to be something different. I know this is different than my normal posts around here, but I hope it encourages you to embrace yourself right where you are. Buy the pretty clothes and treat yourself to something nice in whatever stage of life you find yourself in! I think you’ll enjoy showing up for your life regardless of the scale or the dress size! Aww, thank you, girl! I’ve done some try ons, but not too many. It’s encouraging that you think these will be helpful. I’ll try to do some soon! THANK YOU!! I know this is a struggle for many of us girls – part of our DNA, I think. God created us with an inner desire for beauty – we need to know that we are beautiful, captivating and ‘enough’. Sadly, in our society, that means something different that God intended…..yet we continue to strive to accomplish ‘that look’. I love your approach! You look fabulous! Wonderful post Laura! Thank you for the encouragement to just embrace my body as it is but also strive to take care of it by exercising and eating healthier. 🙂 I’m certainly going to give it a try! And I’m going to try to get a couple of cute outfits before school starts in August. I love yours—you look absolutely darling!! Thanks for this. I need this too. Sometimes I have to remember that NO ONE has a “perfect” body. I’m not going to lose weight/exercise/whatever it to a point of “perfection”. There is always more to deal with! I watch the people who put the majority if their energy and focus in their looks, and they are no more content or “done with it” than I am. My brother and his wife are never thin enough. Even when a little underweight. The ones who’ve maintained great figures for decades still age, and sag, and bulk up, and that’s NORMAL. Life is so full of “stuff”, I need to chose the stuff that’s worth MY time, and let other people decide what’s worth THEIR time (and energy and money…). In the end, it’s about choosing happiness over discontent. It’s a comparison thing. I need to leave the discontent behind! Am I the only one who wonders what my “body image” would be if everyone were blind? I have found only 2 stores that sell my size! Most stores only sell up to a 14 so I have a goal to get down to a 14 when I am up and about. I am cute as a button (really not conceited) but built like a linebacker. Thank goodness I have an amazing husband who says he loves my curves! Thanks for your encouraging words. BTW – You look great!!! Awesome post and you look fabulous just as you are! Thanks for having the courage to love yourself and share that with all of us! Thank you for this post, Laura! I have just recently started to accept and dare I say embrace the size I am (16). This has meant trying on clothes that are fun andake me feel good about the size I am NOW. It has been a challenge to accept this body as it is but I do. I still want to work out and eat healthy but however I look I wanty clothes to represent my personality. The ME I am no matter what size I am. Thank you again for being you and by the way you look adorable in that outfit! Great post. Thank you for sharing. We all should celebrate our bodies. After all it is a most wonderful piece of engineering ever. Everything does what it is supposed to without you having to think about it, batteries don’t need replacing, we don’t have to be hooked up to a charger, it is our body and unique. Imperfectly perfect. What are people going to remember about you after you pass away? That she had cellulite, droopy breasts, wrinkly skin? No, you will be remembered as a woman who loved her family, worked hard, was artistic, was kind, had a great sense of humor etc. Just celebrate who you are and what your body does for you. This was a wonderful post & reflects where I am in my own life. I’m 51 & trying to reconcile that I might not be that size 6/8 again. It’s ok! I’d love to be firmer as well but I think the thing that is most important is to feel comfortable where you are in your journey. Embrace it! You look great! Love the outfit! Love the attitude! Keep it up! Thank you for sharing, Laura! It is something I struggle with all the time. Just want to say that I love and appreciate this post, thanks for sharing! I also adore the outfit! Laura- Thank you so much for this post! I think it is so important that you shared this and right before Independence Day, too. I am walking the same path as you in many respects – I’m at the beginning whereas you’ve spent some time on your journey. Your words are so uplifting to me as I contemplate the 16/XL body I’ve been living in for many years now. I’ve had a tough year and I’m working with a counselor on the inner me, which will help the outer me, too, as you point out in your post – these bodies we have house the wonderful people we are in every way. Thank you, again! You go girl, I’ve been there, it’s a journey, good and bad! I have been 18, then 16, now 14 and I AM staying here. DR. always encouraging more but I’m done, just trying to be stronger like you. I don’t need all that hanging skin and flab just a little muscle. Here’s to strong girls!!! Always enjoy your blog. Thank you. Fabulous post! Amen! Thank you! Keep these posts coming! This Post was very encouraging to me I have struggled all my life to love myself for who I am, I have starved myself to the point of making myself sick to look a certain way but I still didn’t love myself or my body! I am now 43 years old and I still struggle everyday with loving my body the way I am. I look at other people and I find myself envying them for how they look, and I am too old to be doing that so after reading your post I am going to work hard on loving me for who I am and quit hating to look in the mirror! This post really meant a lot to me. I just want to say “Thank You”.